While B.C. 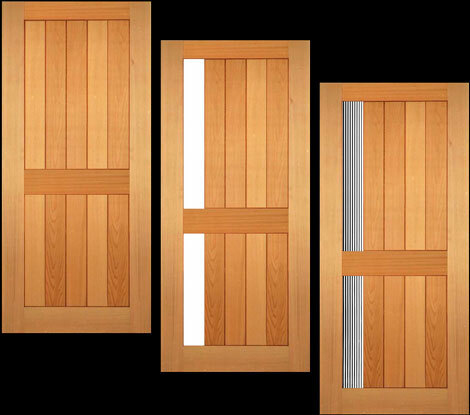 Door has a large library of different door patterns, the design process is largely up to you, the consumer. As all our doors are made-to-order, every design can be altered to match the specific tastes of every individual. Browse our online showroom and order a door as is, or let it inspire you to create your dream door. Design alterations could be as simple as substituting a piece of glass in place of a panel or as complex as the design of an entirely new door that resembles nothing in our showroom. Consider our standard pattern #491 (shown at right). Maybe you like the style, but would like a touch of light? Request the insertion of a piece of clear glass. Clear glass offers no privacy? Request obscure glass instead of clear! If you have a design in mind that is not displayed in our showroom, contact your B.C. Door representative to discuss your design idea and the customization options available to you. Pattern #491 shown from left to right as standard design, clear glass substitution for plank, and pinreed glass substitution for plank.